I specialise in late flowering chrysanthemums and in particular the Large Exhibition cultivars which I grow and supply to growers. I am a grower of over 40 years experience and have exhibited blooms at the National Chrysanthemum Society’s Championships continually since 1975. I have achieved consistent success during this period, Winning the championship 25 times. During this time I have acquired the finest stock and I have re-selected it over many years. I have also been lucky enough to win the Bentley Trophy for the exhibit of most merit in the show 17 times. I have had a varied working environment over the years, from grounds maintenance to nursery work. For the last 20 years of my working life I worked at Pencoed Horticultural College as a grower, and lately as a co-ordinator of evening courses in horticulture. All this has enabled me to gain a lot of experience, which I am delighted to pass on to fellow gardeners. However I have now been retired for 10 years but still retain my interest in all things horticultural. In 1998 Howard Minns and I embarked in an ambitious project, whereby we had our stock micro propagated from tiny meristem tips. This is a method used to rid plants of virus diseases. Most of the cultivars we grow today have shown a marked improvement in vigour and bloom quality. Large Exhibition Chrysanthemums are known as Japs because their parentage comes from Japan, whereas smaller types of chrysanthemums originate from China. In the early part of the 20th century they were the florists flower in the autumn. As time went by incurves and decoratives were developed, and in the second half of the century early flowering types were developed. The florist’s chrysanthemum is now the late flowering spray type because with day length control they can be manipulated to flowers all the year round, hence their abbreviation AYR. I look upon myself along with about a 100 or so keen growers as the custodian of these varieties. I have a J W Cole & Son Catalogue from 1932-1933 which lists 15 new introductions in that year alone and another 141 varieties. Some of these like Majestic and Birmingham have now been reclassified into section 2 Medium Exhibition. Gigantic is listed in Cole’s catalogue but it’s not the same variety we have today because our present variety was raised by Len Shoesmith in 1962. However as you can see they are now an endangered species. Let me illustrate this by looking at Woolmans catalogue of 1956-57 where there are 4 new Large and 2 Mediums amongst them is Lilac Prince which we grew for many years until it deteriorated in the late 1990’s, There were 69 varieties of Large & Medium Japs in the general list By 1967-68 Isley Valley Nursery had 43 varieties in their catalogue, However by 1975 Alan Wren lists just 1 novelty ‘White Harry Gee’ and 3 1974 introductions ‘Apricot Harry Gee’ ‘Elizabeth Shoesmith’ and ‘Phil Houghton’ all are still with us today. In his general list he had 28 Large Exhibition. So you can see by the seventies they were in decline with very few new introductions. 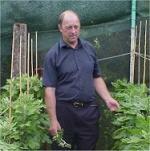 Arnold Fitton raised 6 new varieties in the 80’s and 90’s but since then we have had about 10 new varieties from John Nevill. What we really need is for more enthusiasts to try their hand at breeding new varieties. These are the crème de la crème of chrysanthemums, I say this with absolute conviction because these varieties take between 6 and 8 weeks to develop from the time they show colour. During this period the humidity needs to be controlled in the greenhouse to get them to bloom successfully, therefore they are not any more difficult to grow than any other chrysanthemum but they are more difficult to get to perfection. They are part of our heritage and are really worth growing and saving for future generations. For more detailed information you can purchase the book ‘Late Flowering Chrysanthemums’ written by myself and published by the National Chrysanthemum Society. This is available from their sales manager Barry Hogg, visit their web site for details. In 2011, Paul Barlow and myself produced Chrysanthemums - The Ultimate Ebook. In late December 2012 we updated it to over 440 pages. It has comprehensive coverage of all types of chrysanthemums including some guest writers from the UK and abroad. Its packed with photos and all available as a PDF download at just £10, from this website. I would also like to recommend membership of the National Chrysanthemum Society to everyone interested in growing chrysanthemums. Their bulletins and yearbook contain much useful information, you will find it very good value. They also stock some very informative publications. This site is linked to the society site, so please look at what they have to benefit all chrysanthemum growers. I hope you try some of these magnificent and majestic flowers that are at their best when most other flowers are long past.